Hopefully by the time you're reading this you have already updated Logbook Pro to the latest release, 1.10.43, which released on March 1st. In the past we received support inquiries about the spreadsheet log becoming grayed out and unresponsive after an update was applied. It's not a big deal, simply reset the layout and the problem is solved. We could never reproduce this issue UNTIL a few days after 1.10.43 released and it happened to one of our beta testers working on the new version of Logbook Pro with us. I was able to get exact steps and finally reproduce the issue. The issue is minor and easily avoided. The problem occurs when manually checking for updates within Logbook Pro and you have the spreadsheet style log opened. The update process closes Logbook Pro but does so in a way that it can corrupt the layout. The data itself is fine and never at risk, it's just a cosmetic issue and of course it prevents entering data until the layout gets reset. To update the software safely simply close Logbook Pro and then you'll be presented with the update notifications and you can proceed, or, manually uninstall Logbook Pro, download the latest from our web site and install the new version. It's that simple. Of course, prior to updating any software product, backup your data first. Updating Logbook Pro does not affect registrations or data, it's only the application itself being updated. I apologize for this issue, as I mentioned it's minor and rare but finally reproduced and will be fixed in the next update. The problem is that the same issue can occur when 1.10.44 gets released as that update will have the fix for the subsequent updates post .44. So the next time you get a notification of an update, make sure you close all windows (click Window...Close All) and then check for updates or close Logbook Pro and update when notified of the new version. If you have any questions feel free to contact us for assistance. Again, a minor issue and now we know how to prevent this from happening again. With the release of 1.10.43 we had new CD's made so come and get'em. Software CD's are great to keep for a permanent copy of the software that can be reinstalled at any future date. We all know Windows Vista got a bad rap and some of you decided to spend a pretty penny on a new MAC before Windows 7 came on board bringing us the best operating system ever! No problem, you can continue using the same great software you've always used on your MAC hardware. After all you just invested a lot of money in this new computer, I know you want to find a good use for it. Have no fear, you can continue using your favorite logbook software; Logbook Pro on your shiny new MAC, I'll explain how below. We have no plans to write a native logbook application for the MAC OS and it's unnecessary as you can run Windows on your Intel based MAC with ease. In fact the MacBook Pro is a great laptop for Windows, I personally run Windows 7 x64 on mine. You have a few options as outlined in our knowledgebase article on this topic. 1) I highly recommend (and personally use) boot camp which will partition your hard drive so you can dual boot to either MAC OS or Windows. My MacBook Pro has a 500 GB hard drive so I let boot camp split the partition down the middle allotting 250 GB to each operating system. The process is very easy, here is a great article to walk you through it. With Windows running natively you can continue to use Logbook Pro, APDL, or any of our PDA products just as you did before. 2) If you don't want to partition your hard drive and go through the boot camp process you can use an emulator such as VMWare Fusion to run Windows directly in your MAC OS setup. I use this on my iMAC and it works outstanding! There are other options such as Parallels but VMWare Fusion is the preferred choice especially if you're using any of our PDA products. Enjoy your MAC and continue using the leading logbook solutions you've been using up until this point. Airline pilots can continue using APDL, the free Schedule Importer, and enjoy all of the outstanding printing and binder options available to you. Have an iPhone? Check out Flogger, in my opinion the best iPhone logbook application available and it's under $10 and can WiFi export to Logbook Pro. We're working on our iPhone app and we also just learned StyleTap allows Palm applications to run on an iPhone now. The video tip this month is about a lesser known feature in Logbook Pro - the Logbook Explorer. 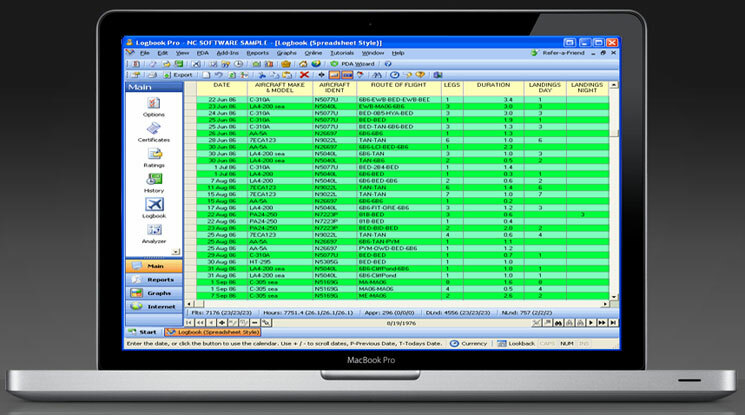 The Logbook Explorer is a great single view of everything you have within Logbook Pro. The Logbook Explorer is a great way to view your Aircraft configurations, Certificates, Ratings, History, Currencies, and Flight Log. In addition, there are unique data analysis capabilities such as footer summaries, the ability to filter flight records by a specific aircraft type, etc. If you haven't used the Logbook Explorer take a look at the brief video after clicking the play button above and then experiment with yours. To learn more about the Logbook Explorer click here for the documentation reference. I hope this helps you learn something new today. We've been selling quite a few Enterprise Edition licenses lately and getting quite a few inquiries about companies buying Logbook Pro for use in their business for all of their pilots. I thought I would take this opportunity to explain the value of the Enterprise Edition as it has been coming up so much lately via our help desk. Logbook Pro comes in three editions: Standard, Professional, and Enterprise Editions. To read more information about the differences in the editions you can either scroll down on the Logbook Pro product page or read the knowledgebase article on this subject. Also note that you can upgrade from any lower edition to a higher edition at any time and no new software installations are required, just click Help...Activate and enter the upgrade code. The Enterprise Edition is designed for a single computer to be used by multiple pilots. This scenario is perfect for households with multiple pilots, flight schools, corporate operations, etc. The Enterprise Edition licenses a single computer (terminal) to be used by unlimited pilots by enabling the File..New and File..Open functionality. The same features enabled in the Professional Edition are enabled in the Enterprise Edition as well. So if you want to sync data files between another computer running the Professional or Enterprise Edition of Logbook Pro, you can do so. Each pilot that uses Logbook Pro creates their own data file, each of which can be password protected. Data files are like Word documents in Microsoft Office, they are individual files and can be stored anywhere that can be accessed from the licensed computer through the internal network (not Internet). So if an organization has a storage location that is backed up nightly, this would be a perfect place to store the Logbook Pro data file when creating it. This also allows a pilot to use any of the licensed and available computers within the organization or household to access their data file via the network share. One feature that is often requested is the ability to aggregate data for all the pilots in an organization. This is not yet available but is expected in the next major release of Logbook Pro. In the interim, however, each pilot can run the required reports needed by their employer, export the reports to PDF and then e-mail them to the person that aggregates the information. It's just as good. For any questions regarding licensing multiple computers with Logbook Pro Enterprise Edition feel free to contact us. For organizations buying over 10 licenses contact us for a volume discount. I know some of our binders are a bit expensive, that's the cost of fine leather and a quality binder for those that want it. We also know there are a lot of student pilots, private pilots, instructor pilots who can't afford or don't want one of the more expensive binders. So about a year ago I told Cirrus Elite I wanted a binder we could sell for under $50 to support our general aviation market. Our leather binders are typically purchased by our corporate/airline market, I want every Logbook Pro user to have a binder. Matt and Brandon, the two outstanding gentlemen running Cirrus Elite, came through as they have 100% of the time when asked to meet any other request or challenge. They present the luxurious Sport series binder with the look and feel of leather without the cost of leather, and it's not leather, but that's our secret! 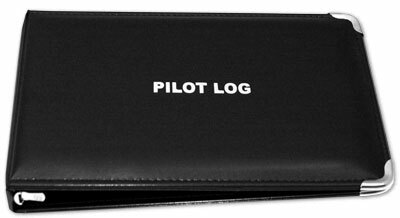 This binder is perfect to hold your hard copy backup and presentation of your flying career for safe keeping and presenting to anyone needing to see your logbook. In the past I preached over and over "Backup Backup Backup" - never trust your computer! And I developed an Online Backup service that has taken off like wildfire, I'm so happy you all like it! Now please do yourself another favor and PRINT your logbook and keep that up-to-date along with your digital version. You never know when something catastrophic may happen, or your computer gets stolen! I hear stories all the time! We have had several data entry service jobs where people send in their Logbook Pro printouts believe it or not! So sad, but true! Click here to learn more about the fantastic and affordable Sport series binder. Take a small part of that tax refund and treat yourself to a binder. You've earned it. Think of all the money you've spent on learning to fly and flying thereafter, $45 for a binder is well worth it. Enjoy! Want to receive this newsletter directly in your inbox? Click here to subscribe. To opt out of future mailings click here or manage your newsletter subscriptions online by clicking here. You may mail your unsubscribe request to: NC Software, Inc., 4870 Sadler Rd, Suite 300, Glen Allen, VA 23060. Logbook Pro is a registered trademark of NC Software, Inc.